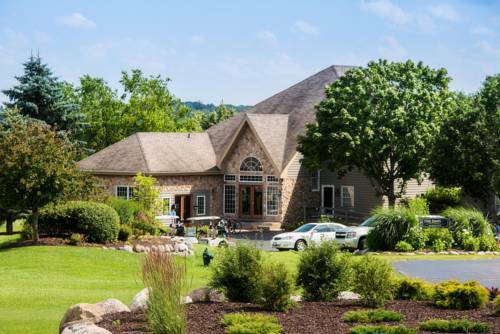 The Inns of Geneva National is located in the prestigious Geneva National Resort Community overlooking rolling hills, woodlands, lakeshore and Gary Player Golf Course. Each Inn offers the comfort and ambiance of a private residence with all the luxuries of a world class resort. Vaulted ceilings, fieldstone fireplaces and private patios. Ideal for golf outings, corporate retreats and social get-togethers. Creative Fine Dining in a casual atmosphere. The Hunt Club specializes in steaks seafood game and more. Open for dinner only all year. Signature dish is the 25 oz Tomahawk Chop. Casual dining available April to October with outdoor seating available overlooking the golf course and lake. The elegant Grand Ballroom features 90 feet of windows overlooking the golf course and Lake Como. Our Boardroom, the Lowell Room offers an elegant and professional setting for your meeting. ~13 miles from Lake Geneva. ~27 miles from Lake Geneva. 1927 Wadhams Oil and Grease Company station is at its original location. Tiny, with a unique curly roof of the Orient. ~39 miles from Lake Geneva.